I had another session with my counselor this morning. It had been about 6 weeks since I last checked in with him, and based on the events of this past week I felt it was time to get his read on things. As per usual, I began by describing the events of the past six weeks; there’s no point in rehashing those here, since one could easily just go back through my archived posts to read first-hand about all that. What I needed was perspective. Why has her energy seemed to shift toward the positive over the past few weeks? Why did she change her Facebook cover photo? Why has she not shied away from spending time with me? Why is it that we can actually have such a good time together? Well, the reason is because she’s my wife. I know that’s a simple enough answer, but that’s kind of the long and short of it. I’ve known her for a long time, and I know her better than pretty much anyone, and especially far better than the adulterer. I know what she needs. I know what worries her. I know what makes her happy. I know how she reacts to things. I know how she thinks about the world. She is my soul mate. We chose each other, and when I chose to be with her, I chose to be with her for life, not just until things got tough. My counselor’s assessment of the situation is that things are trending positively. She is not the typical obstinate spouse. Those tend to just blow off their spouses, they turn a cold shoulder, and can be mean and vindictive to boot. My wife is not like that. She has tried to be cold with me, but it doesn’t last. It’s too hard for her to bear. She pretends not to take my calls, but then she listens to all the voice mails. Then she buys me gifts. She wants to celebrate my birthday with me. She offers me her cheek for a kiss. And so on. He (my counselor, that is) feels that it has been my constancy that has gotten us to this point, the fact that I have stood for what is right, not backed down, and shown unconditional love. He even went so far as to say that it probably makes no sense to her at all why I would still be showing her love after all she did. I show her that love because she’s my wife. Okay, so where to from now? Basically, the plan is to stay the course. There could be surprises ahead: my wife has her last professional engagement in town this weekend, and after that she might just try to blow me off. The counselor assured me that, if this were to happen, it would just be temporary. He suspected it wouldn’t be that likely, though, and that she’d still keep coming to town and would still try to connect with me. He felt it likely that she is beginning to see things not working out according to her plan, and that it even could be possible that the adulterer was starting to want her to move out. I’m not so sure about that latter part, though. I would not be surprised if there were problems, though. He did assure me that the affair was likely to end pretty soon, and that they are just one argument away from that happening. One thing he said to me was, “if I were immoral enough to date a married woman and to have her live in my house, I wouldn’t want her to be hanging around her husband.” That would certainly explain why my wife appears to be hiding things from him. That makes sense. It’s been 7-1/2 months now, and this is the time when any relationship starts to become very human. It’s the point at which the infatuation lenses come off and the other person reveals himself as he really is. In this case, that other person is a petty, insecure, immoral, unprincipled, selfish, callous, insensitive, untrustworthy, and unethical person. He’s a liar and a cheat. He is a failure at marriage and relationships. All of the personality traits that led to his other relationships failing will resurface again, and these will be exacerbated by my wife’s own personality quirks. Now, I can handle those quirks: I’ve got the coping skills for that. He does not. He will fail again. The session ended on a very positive note. Again, I had the encouragement to stay the course, this time with the knowledge that we are definitely in the home stretch. I do see things likely wrapping up short term; rather than looking at weeks to months, I think we’re looking at days to weeks right now. I’ve made predictions before and most of them have been wrong, but somehow I would be surprised if this drags on more than another month or so. When I look at other reconciliation stories, one of the things I’m struck by most is how quickly they turn around, and how implausible those turn arounds seem even 24 hours beforehand. When you read someone’s story of reconciliation and look at where they were just a month before that reconciliation started, you often find a situation that seems desperate and hopeless. Things seldom are desperate and hopeless when it comes to reconciling, though, provided you know what to do. I guess I should just say “stay tuned”… There are interesting times ahead. So I finally took the plunge and bought a book on the I Ching. I guess the online resources just weren’t enough for me, and I felt the need to do a bit more in-depth work, or something. I ended up buying this book, The Complete I Ching by Alfred Huang. It was quite an eye-opener. The author provides a very close translation of the original texts, and this means that the metaphoric and often vague qualities of those texts are preserved, leaving ample room for interpretation. This is the art of divination, I guess: learning how to interpret the texts in a way that illuminates the situation. The main hexagram was #8: Union. Good fortune is to be sought in seeking union. In this reading, there was one moving line — the fourth line from the bottom (called the fourth six), indicating that the one who seeks union from without will find good fortune by being steadfast and upright. In this hexagram, the correspondence between the first (bottom) and fourth lines is weak, since they are both yin, so the upper yin (fourth line) yields to the line above, which is yang — and the only yang symbol. The weak yields to the strong. I also learned about the so-called “mutual” hexagram, which is composed from the inner lines of the main hexagram. Basically, what one does is to take the second, third, and fourth lines from the bottom and construct these as a new lower trigram, and then take the third, fourth, and fifth lines from the bottom and construct these as a new upper trigram. This yielded hexagram 23, Falling Away. The image here was one of mountains eroding into the ground; this sounds perhaps negative, one metaphor given was that of building a house on a solid foundation. One acst in accordance with the situation and keeps still; unnecessary actions, emotional baggage, and mental clutter can fall away. The moving line of the main hexagram (#8, above) changes that hexagram to #45: Bringing Together. This is a strengthening hexagram 8, Union, in that it has two yang lines in the internal positions of the upper trigram. There is correspondence between these yang lines and the yin lines in the lower trigram. This hexagram again states that it is favorable to be steadfast and upright, and should one do so, there will be good fortune. The mutual hexagram of this transformed hexagram is #53: Developing Gradually. Again, this augurs good fortune and favors steadfast and upright behavior. My interpretation, amateurish though it may be, was one of positive and auspicious indicators. This reading is very positive and auspicious. It begins with the premise that the one seeking union from outside (me) will find that fortune fulfilled by being steadfast and upright — a common theme throughout this reading. For the one who lags behind (my wife) there will be no way out: the only way forward is through reconciliation. This will become evident. Concomitant with this is an erosion of the negativity that has plagued our situation, and this yielding of the weak aspects (immorality) to the strong (morality) will allow the strong to build a foundation that is favorable for the continuance of the relationship. The moving line is in a very favorable position, and indicates the strengthening of that union. The original symbol is water above earth, and this consolidates to lake above earth: a great gathering of the forces. The forces involved will bring us together, creating great fortune. The mutual hexagram of Developing Gradually indicates that this situation indicates a gradual movement forward through reconciliation, with a strengthening of moral behavior that will enable this relationship to progress from its strong, stable foundation. Or so it would seem. How is this going to play out? I have no idea. I do have a session with my counselor tomorrow in which I at least can talk over some of the recent, more positive developments. I very much look forward to his insight. Following yesterday’s relatively momentous “date night,” I put in a very busy day of work and am now sitting here with a glass of Merlot by my side. I put “date night” in quotes, because it’s not a 100% accurate descriptor, but that’s what we call it in the marriage reconciliation biz. Successfully married couples tend to do this as a matter of course; unsuccessful ones often do not. It’s not totally accurate because a) it might not seem like a date, and b) it doesn’t have to happen at night. I was kind of on an emotional high yesterday, and needed a bit of grounding. I know these reconciliations can turn on a dime, but I also know that my wife has had an agenda that has been attached to a 7-month-old narrative, and those narratives don’t necessarily just fold on the virtue of one “date night.” That’s not to say that one such experience can’t be instrumental, but I just simply could count on that, and needed to be careful. Thus, I consulted the I Ching. That’s right, the I Ching, the Chinese book of oracles. I got a copy of it when I was a teenager via the estate of a great uncle who was a noted architect, inventor, and intellectual. I never really gave it much thought until I entered grad school and began studying the music of John Cage. Then I began to explore the process of divination via the I Ching, but never really did much with it. Fast forward a number of years to 2012, when yours truly finds himself in the midst of the marital crisis of a lifetime. I have a spiritual practice that keeps me grounded, and which has involved various mantra recitations harvested from the Buddhist sutras. Out of curiosity, I purchased a couple of CDs with teachings on the older Vedic mantras that predate Buddhism, and incorporated a few of those into my practice. One of the CDs, by the late Thomas Ashley-Farrand, is on the topic of relationships, and how mantras can be utilized to attract, improve, and repair them. 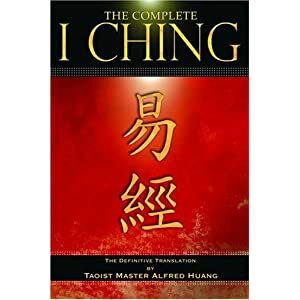 On this CD, he speaks of consulting the I Ching when he had issues with his wife, and would then choose mantras base on that divination. That sounded compelling, so I actually sat down and did a few divinations last night. It’s not that hard: you pose the question, toss a set of 3 coins 6 times, and from this construct a hexagram of broken and unbroken lines. Traditionally, one would use yarrow stalks, but who has those at hand? There are online tools that help you to interpret these hexagrams by giving you the relevant texts for each hexagram. My questions all surrounded my wife, our relationship, and particularly her affair, and I kept getting the same results: obstacles (the affair), revolution (presumably the affair crumbling), and the need to be cautious. I had been milling over the idea of booking a session with my counselor, so I posed that as a question, and the result was pretty clear: do it. So I booked that session this morning. He’s not available until Tuesday, so I guess I’ll have to hold tight until then. There will be much to talk about, that is sure. His sincerity attracts and inspires others whom gold could not. The transformed hexagram that follows was hexagram 2: K’un, or receptive force. This one is pure yin, and is nothing but broken lines, as shown below. The text and interpretation are given next to the diagram. Now isn’t that interesting? Stay the course. This is what my counselor always says. Stay the course. This totally makes sense to me. So what am I to think of this? I don’t know. I’ve been committed to staying the course for 7 months now. I guess that things were so heady yesterday that I felt like I could shape things with my actions right now, but I do know that to be untrue. There are too many other variables that just cannot be controlled. The only thing that I can do is to receive the stimuli, and to react appropriately. Those are my musings for the evening. I shall let the winds of karma blow me in the directions that I need to be taken, and will do my best to act with the appropriate skillful means. Not much else a guy can do, anyway. Today was my weekly allotted meeting with my wife. It also happened to be the day on which she chose, belatedly, to celebrate my birthday. It was a very good day. She texted me this morning to tell me that she would be ready to go around 9:30. I had kept the whole morning and early afternoon open, so I was ready to go at any time. I had a gift wrapped and ready for her, too: this time, it was a picture she had left behind, one of her dog as a puppy that one of our former neighbors took and gave to her. It has great sentimental value to her, and for some reason she chose to leave it behind in our bedroom. I thought it fitting to give that to her. I was looking through the closet and came across an envelope with some Austrian coins. My wife first went to Vienna many years ago, probably in the late 1990s, and she kept her leftover currency in that small envelope as a souvenir. I put a little note on it, something to the effect of, “I came across this in the closet” and wrapped it up in the same package as the picture. I put this into a colorful paper bag, along with a card that I had bought. On that card, I wrote a simple note thanking her for wanting to celebrate my birthday with me, and saying that it meant a lot to me. These I took along with me in the car as I went to pick her up. At home, I left behind a small gift of a pack of Japanese potato chips, salt and seaweed flavor, exactly as pictured in this link. I left this along with the dog’s carrier, because she’d be coming to get the dog today, since next week is her “custody” week. As for the dog, I put her into the car, since I figured my wife would want to see her. We set off to the acquaintance’s house. I called just before arriving there, and when I pulled up I saw the van of the acquaintance’s husband in the driveway. He lives out of state now, and they are in the process of separating, and probably will end up in divorce. As I wrote about yesterday, I would hope that their situation be illustrative to my wife about the horrors of divorce, and also illuminative as to how fundamentally different and better our own situation is. She came out, bags in tow as per usual. She seemed pretty happy to see me. She was also happy to see the dog. She got in the car, and I jokingly tried to give her a kiss, and she backed away. We chatted a bit, and we both agreed that we shouldn’t schlep the dog around, so the first thing we did was to stop by the house to drop off the dog. On the way there, she told me that her acquaintance’s husband had come home to pack up his stuff and move out. This should be illustrative as well for her, I’m hoping. Then we set off for coffee. On the way out, my wife brings up the uncomfortable things. She wants to reckon our cell phone bill and cancel her phone line. I make no comment. She wants to shift her rental piano to my name. Again, no comment. She asks me to stop by a nearby bank, where she has an account. These are the “secret” accounts that I’ve known about for a while, and she told me she opened them because the branch was nearby during the time she was staying with her friend a couple of blocks from our home. This is true: she could just walk there. Unpleasantness out of the way, we set out to have coffee. I headed us toward a favorite spot where they make a drink called the “Sevilla,” which is basically a mocha with orange zest in it. She offered to pay. We chatted for a while and had a pretty nice time. So far so good. She brought up lunch, and she offered to take me out for sushi. (Yes, that picture is what I ate.) But it was still a bit early, so I suggested we go off to a favorite neighborhood to do a bit of shopping. She also mentioned that she had a gift in her bag for me. We got to that neighborhood, and she gave me that gift. It was beautifully wrapped, and I nearly broke into tears. I gave her a kiss on the cheek and she did not back away — in fact, she offered me her cheek. I suggested I open it later. She noticed some new shop — I guess she hasn’t been in that area for some time, since it appears the adulterer doesn’t really get around too much. We stopped in a “natural apothecary” so that I could buy some incense, and she aksed them for some herbal tea that would help her throat. It seems like her health is a bit depressed these days, which is not surprising, considering the stress she is putting herself through. They put together a concoction for her, and she bought some bath salts as well. We then did a bit of window shopping and ended up in a clothing shop. She browsed a bit and I tried on a shirt. It was very much like old times. She has not said anything like that in a long time. Since about January or February, she has been referring to it as “your house,” and has been clear in saying that she does not live there anymore, assuring me she won’t come back, etc. And here she makes this huge Freudian slip, calling it “home.” I could hardly believe my ears. She was in the restroom for quite a while, and when she came out, the first thing I’d noticed was her eyes. It looked like she’d been crying. You know the look people get when they’ve cried? Their eyes get sort of glassy and a bit puffy, and sometimes their cheeks are a bit discolored from the tears. Well, there was no sign of running mascara or anything like that (maybe she’d fixed that while she was in the ladies room) but her eyes definitely had that post-cry look about them. I could be wrong, but I don’t think I am. I think she had some tears while she was in there. That last stop was to the same shopping I took her to last week. On the way there, I took a bit of a detour and suggested we stop by a shop I wanted to show her. This was a consignment shop at which I’d gotten a few things for her over the past few months, and I figured she’d like it. The first thing she noticed was the big, friendly dog on the couch as we entered. He came up to greet us. She immediately started browsing and saw a bunch of things she liked. She eventually saw the collection of Fire King glassware that I’d bought a few pieces from. She didn’t buy anything, but I got a lot of ideas about what she does like. I told her I’d been visiting a number of consignment places from time to time to look for unusual little things. That definitely made an impression on her, because she has never known me to be that kind of person (I am now), but she has always been one to go to such places. We finally did have to leave, so I dropped her off at the shopping center where she’d spend the next hour or so, prior to heading out to teaching some students nearby. I thanked her for everything, and told her I’d see her in a couple of days. (I did not say a week, I just said “a couple of days.”) This time, she offered me her cheek very clearly, and I gave her a kiss. Then she got out of the car and waved goodbye as I drove off. If I were dating my wife, I’d say that I scored a 9.5 out of 10. (I’m subtracting the 0.5 for the uncomfortable stuff at the beginning.) Well, heck, I am dating my wife at this point. Remember? I’m the other man now, in a way. All in all, I’d say it was a good day. I am feeling very hopeful about reconciling quite soon, and am cautiously optimistic about everything. I guess I have to be a bit cautious so that I don’t derail anything good that’s happening right now. We’re not reconciling yet, but it seems like the momentum has shifted somehow in the past 2 weeks, and I just hope it keeps going in that direction from here on out. I suspect the title of this page is probably going to be incongruous to its content. I guess that would make it organic to my life, which is full of incongruities right now. My birthday occurred over the weekend, and as expected my wife was notably absent. Oh, I did get a text message, but that was about it. That message said she was looking forward to celebrating my birthday with me, on Thursday. That is, tomorrow. Or, put another way, four days after my actual birthday. But hey, I’m probably one of the few guys in the world with an obstinate, wayward spouse who is reaching out to him in this way, right? So, I’ll take what I can get, and be grateful for it, too. She has been incommunicado since Sunday. The text was kind of predictable, because she’s back in town. Whenever she comes into town, she has to emerge from the fog a tiny bit to confront the real world. You know, the one that the rest of us live in. She has found temporary safe harbors for these frightful jaunts into the real world, and these come in the form of the homes of people who are uncritical about her life decisions. They may be naive, thinking her truly to be on some sort of genuine path of renewal, or they may be pathetic, as is the case with the place she is staying tonight. I’ve written about this place before: it is the home of an acquaintance who is currently in the process of dissolving her marriage, or at least trying to figure out how to do that all alone, without the help of her husband. The husband left a few months ago, and is living in another state. Well, that husband is back in town. I don’t know why, but he is. Maybe he wants to visit his kids. He has a college-age son and a daughter in grade school. The daughter began pulling her hair out when the marital crisis erupted in their family. That was at least two years ago. She will carry those scars for the rest of her life. I feel truly sorry for her, as the damage will be even more severe and likely permanent if her parents do not reconcile. And it does not look like they will, but I hope I’m wrong. I mean, daddy is back in town, right? This should be an instructive situation for my wife. She will see in full force the true dysfunctions of a family in the throes of marital separation and dissolution. Then she can compare that dynamic with ours. She has a husband who showers her with unconditional love. This acquaintance does not: her husband became a drunk, threatened her with physical violence, and then moved out. Theirs is a tale of despair and sorrow. I am pretty certain that this acquaintance would not want to celebrate her husband’s birthday anymore. Thus the incongruities abound. My wife reaches out to me. She wants to spend time with me. She actually seems reservedly positive as well. I am truly hoping things go well tomorrow, because it will make it that much harder for her to carry out her futile and hopeless agenda. There is one other incongruity I simply cannot explain. As I’ve written before, she has blocked me from her Facebook page, so I cannot see what she’s up to. I do, however, have a spare Facebook account, one that I opened with the possible intention of creating a professional page. Well, that never happened. It just languishes there, with neither friends nor likes. But it also is not blocked. This means that I can see her public profile. Although it’s limited, I noticed something very peculiar a couple of days ago: she changed her “cover” photo. So what, pray tell, is that new cover photo? Well, it’s one that I took of her back in August of last year. She’s standing in front of the mural at the Roslyn Cafe. Remember the show “Northern Exposure“? My guess is that, if you were old enough to be watching TV back in the early 1990s, you would remember it. If not, well, it was a show about a doctor with a freshly minted M.D. who was getting student loan remission by being sent off to the boondocks to be a community general practitioner. In this case, he was sent to the fictional town of Cicely, Alaska. Cicely, like many things televisual, doesn’t actually exist. Oh, it was supposedly fashioned after the real town of Talkeetna, Alaska, but nevertheless Cicely does not exist. In reality, it is the town of Roslyn, Washington. You know, Roslyn, at the western edge of Kittitas county, on the eastern slopes of the Cascade Mountains, population 893. Or perhaps you don’t know Roslyn. Well, I do. There’s a brewery there, and I do like my beer. They also make pretty good root beer, and my wife likes root beer. We used to live in a small town about 30 miles east of Roslyn, a college town where I had my first job. We would occasionally go up to Roslyn to get out of the summer heat, or just to go have a root beer. It was a nice drive along old country roads most of the way, and the town itself has a rustic charm about it. It’s an old coal mining town, populated initially by a healthy cohort of Croatian coal miners. There is even a Coal Miner’s Memorial that was recently installed. The town is almost hip, in a way — there’s even a glass blowing studio there, just behind that memorial. Anyway, the aforementioned mural is one of the big tourist draws in the town. I’ve taken a number of pictures of my wife in front of that mural over the years. It has nostalgic connotations for us. When we went there last August, it was the first time we had visited that area in three years. We spent the morning and afternoon in our old home town, visited the sights there (limited as they are), headed out to visit some other friends out in the countryside, and then hit Roslyn on our way home. The air is really fine there, clean and crisp, and it is very quiet. The people are friendly and laid back. And there is also the brewery. Oh, and there’s a totem pole, too — that’s what you see in the picture featured for this post. Thus I’m wondering why, all of a sudden, she should choose to put this picture onto her Facebook page. It hardly strikes me as a random or haphazard event. In a way, it almost seems like she is trying to send a message, like she’s trying to test the adulterer by shoving a bit of her former life right under his nose. I’m sure he sees her Facebook page; he has his own page, too. I can’t imagine she has told him about the provenance of that photo. That would not go over too well, I think. So that’s where things stand today, 7 months and 13 days after the beginning of my wife’s descent into the depths of egotistical self-deception. I’ve been nurturing my connection with her slowly and steadily for most of that time, save for the first 22 days that I was unaware of her betrayal, and then the following week that I was trying to find my feet and figure out a way forward. I’m starting to think that this is “crunch time,” in a way — a time when the situation in our relationship gets critical. Critical for me, sure, but I can handle it; it is far more critical for her, since she entirely lacks the skill or wisdom to handle the inevitable breakdown of her current trajectory. Wish me luck, dear readers. If I have anything to do with it, tomorrow will signal a real turning of the tide for the better in our situation. Today there was an annular solar eclipse. In the Tibetan Buddhist tradition, both lunar and solar eclipses are considered auspicious days on which the effects of karma are multiplied. Technically speaking, effects of good or bad karmic actions are said to be multiplied by 10,000. That’s a lot of karma. Today was also my birthday. Don’t forget to open your heart! Boy, that one cut straight through to me. Afterward, I had lunch with some of my dharma buddies, and then went home. Things were pretty uneventful at home. I mean, my wife isn’t around anymore, so I only had the dog to keep me company. I had a Skype call with my family. Then, out of the blue, my wife texted me to wish me a happy birthday. I don’t know if it was a Freudian slip, but she actually said she hope I was having a “forgettable” birthday. I think she just missed the “un-” prefix by mistake. Her text said she is looking forward to celebrating my birthday with me this coming Thursday. She originally suggested this idea a couple of days ago, suggesting Wednesday or Thursday as possible days to get together. I said either day was fine, but also suggested today, of course, telling her that I’d be free. I knew she would likely reject that idea. In fact, I just got no response. This leads to the question as to why she could not spend time with me today. Her behavior last week was a bit odd: she decided to let me keep the dog for an additional week, stating that she was going to be busy. I suspected that she was going to go on a trip with the adulterer. I didn’t really have any evidence; it was just a hunch. Her story did not make sense. She is not busy, and has almost no professional commitments anymore. I did learn yesterday that the adulterer went overseas for a quasi-professional trip related to his hobby and did not take my wife. Hmmm. This means that she was home all alone at Camp You-Know-What for the weekend. Interesting. This still leaves the question unanswered as to why she couldn’t spend time with me today. Well, I pretty much know why: a) she’s 40 miles away and cannot drive, and b) she doesn’t want to. I do think she feels guilty about this, though. What actually doesn’t make sense is her texts to me this past week. She texted me on Thursday night, quite late, to thank me for a card I gave her. The adulterer had already left for his trip, so she was alone and didn’t need to hide that from him. The following day she texted to ask me about celebrating my birthday with her next week. Then she texted me today to wish me a happy birthday. Oh, she won’t talk to me — no, that would be too personal, I suspect, so all my calls go straight to voice mail. But at least she did reach out via text. Still, this is not the behavior of a woman who wants to get rid of her husband. I will take any contact I can get from her. Because of the solar eclipse, there was an extra practice at the Dharma center that is done on auspicious days like eclipses and equinoxes. It’s called Aspriation of Samantabhadra, and is said to bring immeasurable benefit. It’s a pretty simple practice that just entails reciting a liturgy; today’s selections were a bit longer than normal. We followed this with the weekly Green Tara practice I’ve written about so many times, and I was privileged enough to lead it tonight. Since this crisis started, my aspiration during this practice has been that the confusion my wife is living in be cut through, so that she can stop producing such horrible karma. I’m hoping that what they say about this karmic multiplier is true — maybe I can generate enough positivity to actually bring that about. I know the title above is a bit of a strange one to give a post. It could also be read a number of ways, e.g. 1) I am turning into the “other man,” as in acting just like him; 2) “becoming” could be read as “befitting,” as in “actions becoming the other man,” or 3) I am literally becoming the “other man” in this equation. Yes, this is a bit logical and perhaps too over-reasoned, but that’s how my mind works. Of the three possibilities, I’m really talking about #3, and in a way it’s a good thing — a very, very good thing. Allow me to explain. My wife was in town yesterday for the second day of her typical weekly two-day stay. I saw her the day before yesterday, and gave her a ride downtown. This triggered my rant about various suspicions I have about what she’s doing, pretty much all of which are still unsubstantiated right now. As she was getting out of the car on that day, I asked her out for coffee for the following morning, and she gave me a non-committal answer. Yesterday morning I got a more definitive answer. I called fairly early, and asked her out. My call went straight to voice mail, and I heard nothing back for a couple of hours, so I just went about my day. She called me as I was in the midst of some mid-morning errands. I was a few miles from where she was staying, but we agreed to meet about an hour later after I’d had the chance to take care of the errands and feed the dog. So it was that at around 11:00 a.m. I showed up at the house that she was staying at. She looked very tired, her eyes were puffy, and her energy was very low and pretty negative. This is more or less what I’ve become accustomed to. I brought the dog along with me, since she is committing to going another week without seeing the dog, and she seemed very appreciative of that gesture. She asked me to take her to the mall — she had bought some sunglasses, and the acquaintance she was staying with had given her a coupon that she was going to try to apply toward then — so I complied and we drove off toward that destination. I dropped her off at the mall and went home for a few minutes to deposit the dog back at home. She had left her bags in the trunk, and I took the larger one with all of her clothes into the house. Not that I was up to anything devious, but I figured I had a golden opportunity to stage a gift in it. Problem was, I had no gift planned, just a card I’d picked up that morning. I put a silly note in the card and slid it into her bag; then I thought I’d take one of the pictures I’d given her before that she had left behind and put that in her bag as well. I was trying to make it fit when I came across a sheaf of papers in a clear plastic folder. The front sheet said “CONTESTED DISSOLUTION”. This sent me into a bit of a panic. Yes folks, I did snoop a little bit this time. She had all the paperwork right there, but it still wasn’t ready for filing. There were post-it notes all over it in someone else’s handwriting, along with instructions, e.g. “once you have this filled out, file it in room XXXX”. She appears to have talked to a clerk or some sort of paralegal counsel a couple of weeks ago at the courthouse. Okay, so having found this, I began to rethink my plan. I calmed down a bit, and decided not to give the picture — that would have to wait. I also took the card out of her bag, as that seemed like it would be a bad idea. She had another bag in the card, some pillows she had bought, and so I slipped the card in there. As I was driving back to the mall, I thought better of that idea, too, and took the card out and put it into my bag, with the intention of just giving it to her later somehow. As we finished our lunch, she asked me if there were any good place to buy rubber stamps. She is really getting into them, and my gift last week definitely provoked her to think about it. She asked about the shop where I bought that gift, and I offered to take her there. She was a bit resistant, because it’s downtown and kind of a hassle to get there and find parking, but I just said, “come on, let’s go,” and off we went. The moment she saw the store, she remarked that it was “really cute”; my response was, “you know, I do know what you like.” I told her I was going to buy a birthday card for my sister; we are twins, and I wanted to see if my wife had thought about my birthday at all, which is coming up this weekend. Not only had she not thought about it, she had totally forgotten the date. This is kind of incredible to me. She never forgets those things, and we’ve known each other for about 10 years now. I have spent most of my past 10 birthdays with her as well. How could she forget such at thing? We both made some small purchases, and then she told me she would just take the bus back to her original destination. She was going to hang out at another shopping mall that is fairly close to where her clients live. I offered her a ride there instead, and she accepted. I decided on the way there that I would just hand her the card that I had bought, and so as we were approaching that destination I casually said, “Oh, I have something in my bag that I need to give you; please don’t let me forget.” Anticipation is a good thing. We got to the shopping center, I pulled over, and handed her the card as she was leaving. I tried to give her a kiss, but she was leaning out of the car, so I just sort of made silly kissing noises by her shoulder. This made her giggle. Then off she went. It was a very good departure. There were a few text exchanges after that, and they were all positive. I texted to thank her for lunch, and to let her know that I had a great time hanging out. She texted back to thank me for driving her around, as it made her day much easier. I replied by saying that I’m always happy to help. Then, later that evening — much later, in fact; it was around 11 p.m. — she texted me to thank me for the card. This is very, very significant, folks. As far as I know, she was back in the house of the adulterer when she texted me. He is a morning person, is up at the crack of dawn, and had almost certainly gone to bed. If I’m reading the situation right, she waited until he was asleep to text me. Do you get what I’m saying here? I am the other man now. Yes, I am her husband, but she doesn’t believe that she is actually married right now. She has to have that flawed belief in order to commit this affair. The adulterer is her primary partner in her eyes. So what am I? I’m the other guy she is cheating on him with. That’s right: she is cheating on him, and she’s doing it with me. In reality, she isn’t cheating, she’s just being with her husband. But the reality is almost certainly that she is hiding all of this from him. I seriously doubt that she told him that she had spent three hours with me, that we had lunch, I took her shopping, and so forth. And I’m almost positive that she will both keep the card and hide it from him. These are the things that tug on her conscience and that will bring her back to me. It’s pretty much a lose-lose situation for her: she can’t be honest with him, and she can’t be honest with me. The only workable solution is for him to disappear from her life and for her to return to me. And that’s what’s going to happen. Just how soon I am not sure, but I am sure it will happen. I did mention above that we spent about three hours together yesterday. Here’s the really interesting thing about that: I changed her energy. When I picked her up, she was dark, somber, tired, and very negative. When I dropped her off, she was bright, cheerful, and giggling. Her energy was back to pretty much what it used to be like before this crisis began 7+ months ago. That is very significant. I don’t know how the adulterer makes her feel, but I’m pretty sure that I make her feel even better. I have the power to heal her heart and all of her wounds. She just needs to come back and join me in the process of reconciliation.